Ron, a representative of the Illinois Horse Fair, contacted us a couple weeks back to discuss a new website for their organization. After about a week of getting other quotes and determining who they would select, they chose BsnTech because of our pricing and because we were local. Ron provided us the information over the course of a week and we got the website up and running quickly. They decided to have us create the design of the site, setup a slideshow, setup social networking integration, a newsletter subscription, and a link to their ticketing provider. We also setup three pages for them and setup about 19 other “shell” pages. This allows them to go in and add their own content to each of the pages which kept their costs lower. 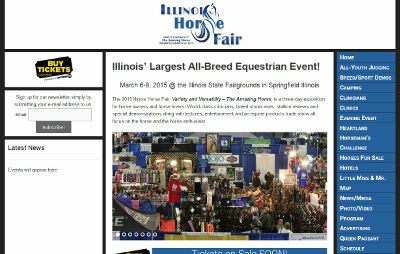 The Illinois Horse Fair website is at illinoishorsefair.com.